LeeAthletics.com is the official website of Robert E. Lee High School Athletics Department, averaging more than 40,000 unique page hits a year. Lee Athletics sponsors 32 competitive teams, both men and women, at the varsity and junior varsity level along with two intramural clubs. Banner and side advertising give you the opportunity to capitalize on the traffic, give back to the local community and support athletics here at Robert E. Lee High School. LeeAthletics.com offers two ad formats and several targeted page locations. Top/Bottom Banner Ad: This format is available on any LeeAthletics.com web page. Top Banner Ad placement is available on any LeeAthletics.com web page, however Bottom Banner Ad placement is only available on the home page. Side Box Ad: This format is available on any LeeAthletics.com web page. Side Box Ad placement will be approximately mid-page on the LeeAthletics.com home page, below the Twitter feed and above the events calendar. 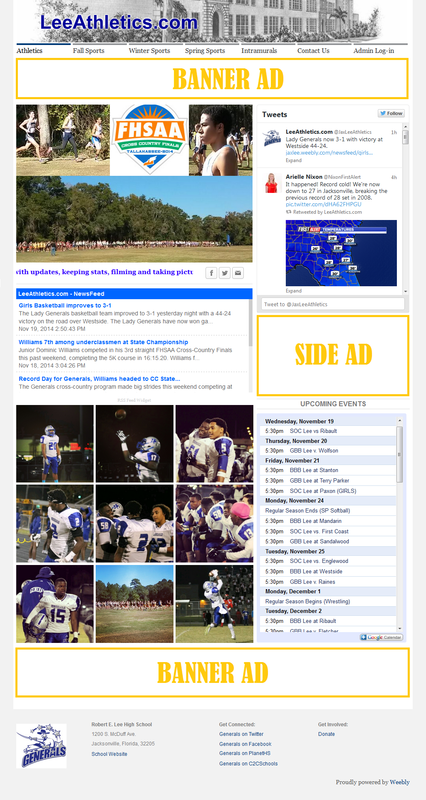 Side Box Ad placement may be placed at the top of any other LeeAthletics.com web page only if a Top Banner Ad has not been placed.